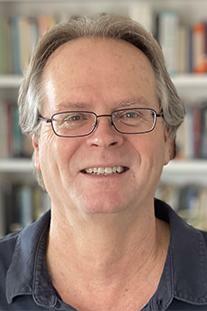 David Starkey is Professor of English and Director of the Creative Writing Program at Santa Barbara City College. He is the editor of two collections of creative writing pedagogy, Teaching Writing Creatively (1998) and Genre by Example: Writing What We Teach (2001), and he has been active in all four genres. His poetry collections include Adventures of the Minor Poet (2007); Ways of Being Dead: New and Selected Poems (2006); and Fear of Everything (2000). Several poems from his most recent collection, A Few Things You Should Know about the Weasel (2010) were featured on Garrison Keillor’s The Writer’s Almanac. His fiction has appeared in American Literary Review, Rio Grande Review, Sou’wester, and in the anthology Blue Cathedral: Contemporary Fiction for the New Millennium. His creative nonfiction has been published in Cimarron Review, Gulf Stream Magazine, Tampa Review, and in the book Living Blue in the Red States (2007), which he edited. His plays have been produced in New York, Chicago, Los Angeles, Seattle, Minneapolis, Toronto, and elsewhere.